Gillette SatinCare shaving cream contains TEA as the third ingredient. It does not contain Triethanolamine (TEA). TEA is often found in foam products, including shave creams and gels. They have been linked with hormone disruption, and can form cancer-causing nitrates and nitrosamines (that's a deal breaker for me). The bottle is made out of plastic... which is great for 1) recycling and 2) rust-proof (If you can see, there is rust on the Gillette SatinCare bottle (ewwwwwwwww)! It contains nourishing ingredients.... This hypo-allergenic foam shave is great for normal to dry-skin people. I am loving the moisturising benefits of the foam shave because it contains aloe and vitamin E (tocopherol). No parabens or other ickys! I also love that Alba Botanica uses 100% Vegetarian Ingredients, and are free of: artificial colors, parabens, phthalates, Sodium Lauryl/Laureth Sulfate or Sodium Myreth Sulfate. They are also cruelty free company! It's unisex! My husband reluctantly will try out things I throw in front of him ("Baby, it's good for you! It doesn't have chems!") and the Alba Botanica Foam Shave was one the times he was willing to be adventurous. One of the reasons he was willing to try it was the scent. It does not smell flowery or girly, it kind of smells ever so slightly masculine, but I don't mind because, well, hey, I use his razors, too! Lol. My husband enjoyed the Alba foam shave -- enough to mention it to me. I catch him using it instead being lazy and opting to forego any cream e.g. using the gel strip on the razor to lubricate his shave. So this is a great product for both men and women to share -- no need to buy his and her's separate shaving creams! The packaging could be better....I love that the bottle is a pump, but I wish the base was larger or wider -- allowing for a sturdier grip on my bathtub wall. When you have one leg propped on the side of your tub, one hand holding your razor, and the other hand trying to help maintain balance ..... pumping up some shaving lotion can get tricky. I also would love to see a scent-free version! 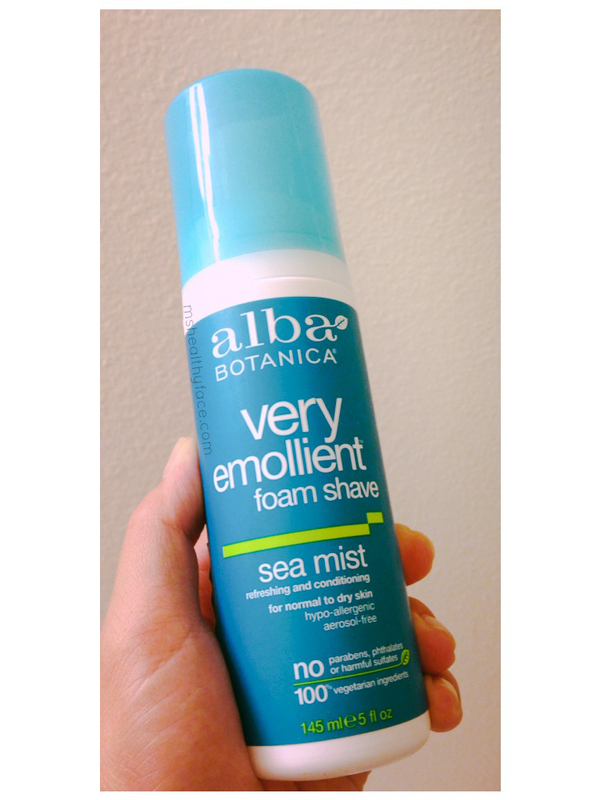 All-in-all, a really great product from Alba Botanica, and a really great alternative to the mainstream shaving lotions available out there. What are you guys using to shave? Aqua (Water), Sodium C14-16 Olefin Sulfonate, Cocamidopropyl Betaine, Sodium Cocoamphoacetate, Mentha Piperita (Peppermint) Oil, Aloe Barbadensis Leaf Juice (1), Calendula Officinalis Flower Extract (1), Camellia Sinensis Leaf Extract (1), Citric Acid, Glycerin, Menthol, Tocopherol, Ethylhexylglycerin, Phenoxyethanol, Butylphenyl Methylpropional, Limonene, Linalool, Fragrance (Parfum).